Facts about Mermaid Weeds. "Scientific name for Mermaid Weed is Proserpinaca palustris L". Mermaid Weed belongs to the submerged and emergent plant community. It is mostly found in bogs, marshes, muddy banks of ponds & streams and swamps. The Mermaid Weed are biologically adapted to soils across water bodies with a high percentage of decomposed bio waste. However, they may switch to terrestrial form of living when the water level of the soil drops immensely during summer. There are two types of mermaid weeds that are mostly seen and wide spread and also the common and the comb-leaf mermaid weed. The color of their stems varies from green to reddish brown and they grow up from rhizomes. The step crimps along the soil for some distance and starts growing vertically towards the water surface. The Mermaid Weeds have two types of leaves (easily identifiable) also submerged and emergent. The submerged leaves are feather divided and may have forked leaflets on them giving a barbed look. Whereas the emergent leaves are blade shaped and sometimes pinnately lobbed. It propagates from seed. It’s an aquatic perennial, spreads roots. The outer plant body dies in winter and the rhizomes are its adaptation to fight the extreme low temperature. New plants emerge from the rhizomes and seeds. Flowers blossom mostly in midsummer. Shorebirds and waterfowl consume mermaid weed’s seeds as food. Other aquatic invertebrates and some fishes also feed upon the trailing leaves and use the leaves & stems for shelter. Sometimes mermaid weeds are confused with leafy water milfoils. The alternate leaf phyllotaxis of the mermaid is marked to distinguish it from the later. 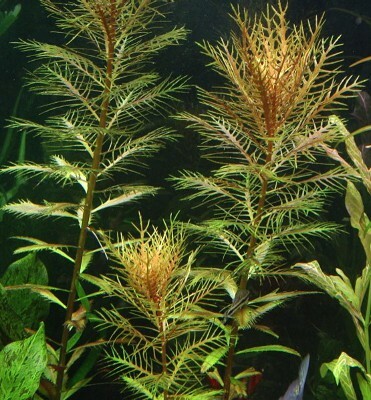 The Mermaid Weed brings gorgeous look to an aquarium if the spreading leaves are cut regularly and required food supplement is given. The Mermaid Weed serves as a great greenish background for the aquariums if a beam of light focused on it.